This addon will display progress bars of currently researched traits. It will also display time left to feed your horses (can be disabled in options menu). You can move them around with mouse. You can also change the appearance from addon's options menu (Add-Ons->Harven's Research Timers) including the left/right alignment. See here: http://wiki.esoui.com/Fonts for a list of available fonts. You can use predefined fonts like "ZoFontGameLarge" or make your own font for example "$(BOLD_FONT)|14|soft-shadow-thick". If you like my work you can make me happy by sending some in-game gold/items to @theharven on EU server (but please, no lockpicks ), eventually you can help me pay my monthly subscription by donating some money. - API version changed to 100026. - API version changed to 100024. - API version changed to 100020. - API version changed to 100019. - API version changed to 100018. - API version changed to 100017. - API version changed to 100015. - API version changed to 100014. - API version changed to 100013. - Fixed leaked local variable "ret". - API version changed to 100009. - Default timers sorting is now by time left descending. - API version changed to 100008. - Added new setting: progress bar alignment. - API version changed to 100007. - Fixed a lua exception which appeared after re-logging when trait research was completed. - Added an option to change font and scale. - Fixed progress bars descriptions in non-english languages. 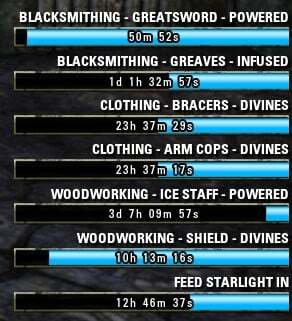 Summerset patch and jewelcrafting have messed up the timers. Any time a jewelcraft research is going on, random timers are removed. I really hope you still have time and will to check if this could be fixed. 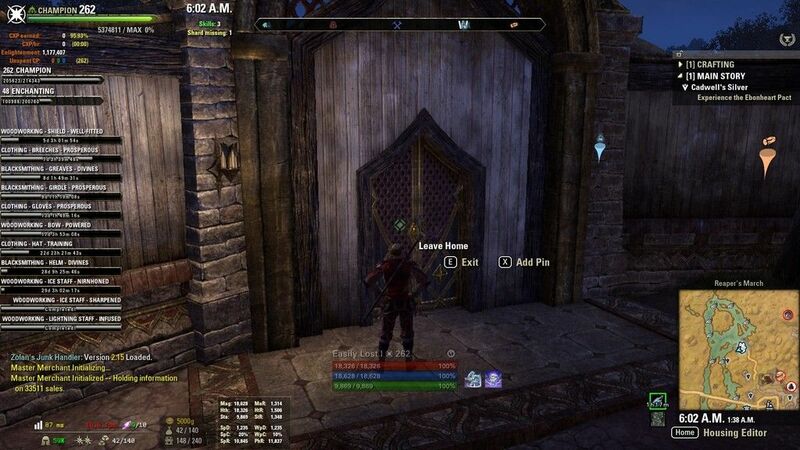 This mod just makes life in Eso so much more organized. Edit: It's come to my attention that the issue mentioned above probably has nothing to do with this or any other addons. Bug seems to originate from the game proper. Apologies for assigning blame on your addon prematurely. Last edited by Viligumi : 05/28/18 at 11:11 AM. It's awersome addon, but can you add ability to clean completed researches and sort by category (woodworking, clothing, etc)? 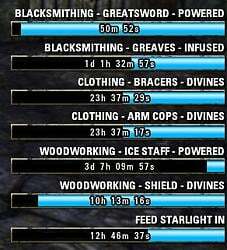 I really enjoy using this mod, I think it would be cool if you also added timers for the Fence merchant, and for daily Crafting Writs! 1. The timers are not correct after you have logged off and log back in, they seem to change to count without research bonus you have from skills. Temporary solution, deactivate mod, reload ui, and activate it again, the timers are now correct until you log off again. 2. When a research is completed, and you are offline, when you log back in, it doesnt show as completed, its simply removed from the list instead. Otherwise its a good mod. Thanks for updating so many of your addons. I thought this problem was fixed by logging off then back on again, but it happened again. Look in lower left corner, just above the chat window . The expired times are still there and no way to delete them. You may want to add a line to the main page that says: When changing sorting order or starting a new research, it will not be sorted until to logout and then log back in. Just thought you would want to know. Last edited by hagermanj : 03/19/17 at 02:01 PM. the error is coming from an out-dated LHAS* in Research Timer. I guess Harven has overseen it, because of his small add-on list. You can copy a newer version from Harven's Potion Alert. Or simply use one of his recent updated add-ons, too. Or "Harven's AS to LAM adapter". I have tried both these and my timers are still 2 days off. Do you have any other suggestions? Thanks. Thanks Votan, indeed I missed it. Last edited by votan : 04/23/15 at 02:17 AM. Last edited by MisaCeliousa : 04/22/15 at 10:32 PM. The opacity option is a good idea, I like it. And themes - You can already change colors and fonts so only thing I can think about is adding some option to change bars appearance to arrow-bars (like attribute bars). It this what you were thinking about? Would be perfect to have different themes for this add on and also maybe low the option to play with the opacity. I was thinking only the bar that is almost done. Would make for a less cluttered interface. Still, I have now found wykkyds toolbar, so I can throw those times in a small corner of the screen. Again, thanks for the great mods.